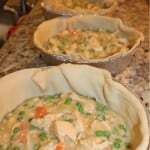 Homemade Chicken Pot Pie - Make Ahead and Freezable! Last week I kicked off the Make It Ahead Monday series with Chicken & Cabbage Potstickers recipe. What a great response there was on Facebook, Twitter and here! This week’s installment is actually one that I’ve been wanting to do for awhile. Did you know that this Wednesday is Pi Day? You know, mathematically 3.14 so 3/14? Celebrated by foodies as Pie Day I thought it would be fun to feature a pie post in honor of it! For real, click on that link and you’ll see it’s been named a real “holiday” (who knew? I didn’t!) When I was younger I used to LOVE a frozen pot pie. You know, the kind that comes in a little red box in the frozen food section? Loved them. But as I got older I realized they were full of calories and fat! Yikes! And some preservatives I didn’t really want either. So a couple of years ago I went searching for a recipe that I could make at home. I found this one in the 30 Day Gourmet Big Book of Freezer Cooking cookbook and I knew it would be a winner since everything I’d ever made from that book we always loved. You can read my review of the book by clicking here. Awhile back I made this for my freezer meal exchange group and they raved about it. Just about everyone wanted a copy of the recipe because their families loved it too! It came in handy too for some friends of ours whose daughter was in the hospital and needed some support during that time (she’s fine now thankfully!) I love that it uses all fresh ingredients too! It was a cinch to put together and totally worth it because it’s great to be able to pull it out of the freezer and bake it up. Wow! I’m getting hungry just thinking about it—I need to make this again soon! This recipe was updated on March 1, 2015 to clarify baking instructions and also put it into a mobile and printer-friendly format. The rest of this post remains the same! Homemade Chicken Pot Pie--Make Ahead and Freezable! A healthier, homemade version of the classic comfort food, chicken pot pie. This recipe includes instructions for making and baking right away or making ahead and freezing and baking later. NOTE: This recipe makes 2 whole pies. Make one to enjoy now and freeze another for later! 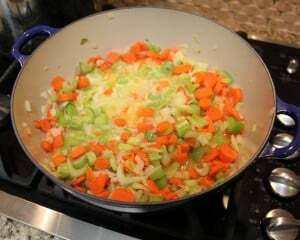 TO MAKE FILLINGSaute the first 3 ingredients in butter in a big skillet over medium heat until tender. Add flour; stir until smooth. Cook 1 minute, stirring constantly. 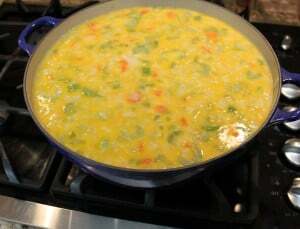 Add chicken broth and milk; cook, stirring constantly until thickened and bubbly. Stir in chicken, peas, salt, and pepper. Cool before pouring into pie crusts. VERY important! FREEZING INSTRUCTIONS:At this point you may freeze the filling in a labeled freezer safe container/bag. To prepare from frozen, read instructions below. Or you may also assemble the whole pie and freeze whole. TO PREPARE POT PIE FROM FRESHPreheat oven to 375 degrees. Bake assembled pie uncovered, for 30-45 minutes or until crust is golden brown. Let stand 10 minutes before serving. TO PREPARE POT PIE FROM FROZENThaw filling in refrigerator. You might need to stir or mush the filling together to combine well and reincorporate. Assemble as described above and bake accordingly. OR you may bake the whole pie from frozen. To do so, preheat oven to 375 degrees. Bake, uncovered, for 30 minutes, then cover with foil and bake 30 more minutes. Remove from oven and let rest for 10 minutes before cutting. Serves 16 (from two pies--if you're just making one pie it will just serve 8). Freezes very well separately or fully prepared in the crust. Try them both and see which way you prefer! 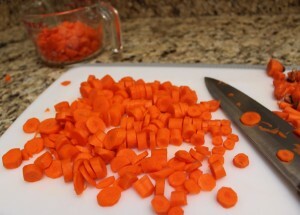 Chopped carrots ready to go. 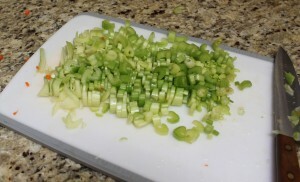 Chopped fresh celery ready to go! Chopped fresh cooked chicken ready to go. Saute all the vegetables together until tender. Simmer all the ingredients with the milk. Everything all mixed together after the filling had thickened a bit. 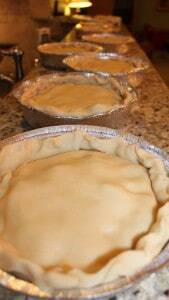 Pies topped and ready to be frozen. Pies lidded, labeled and ready to be frozen until freezer meal exchange group! Ever since my youngest daughter moved out, I have taken up cooking. I enjoy having nobody to tell me they dont like mushrooms or onions or this or that. I happened upon this recipe on Pinterest and had to try it. 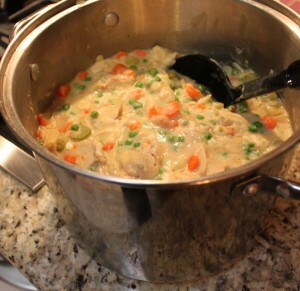 It is now known as “MOM’S FAMOUS CHICKEN POT PIR” in our family. It is amazing!! I tweeted the recipe a teeny tiny bit here and there but thus is perfection if you like chicken pot pie. Tonight 3 of my 5 kids are coming for dinner with their fsmilies. Lol! I will be doubling an already giant pie. I can’t wait to try some of your other recipes, although if they are all this hood, I will be needing weight watchers soon. 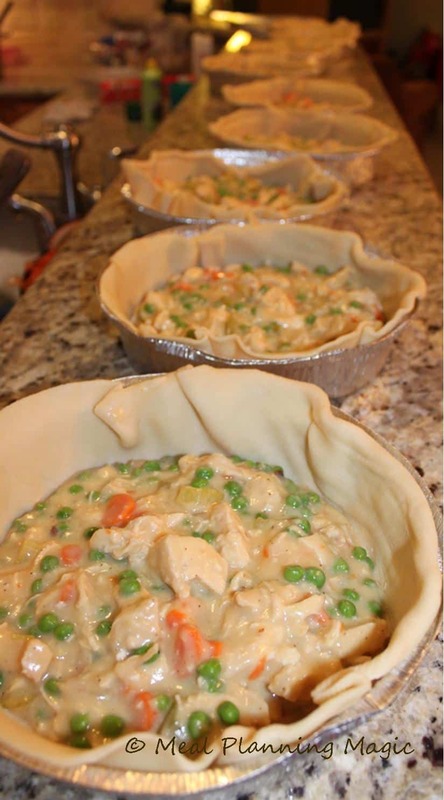 I’m so glad you and your family like this Chicken Pot Pie recipe! It truly is one of my family’s favorites. I like that it can be a bit healthier by using skim milk–you can even reduce the amount of butter too. Thanks for your kind comments! I made this ahead and froze it, I started cooking it tonight and it’s been in for 1.5 hrs, the crust for some reason won’t bake…. this is my first time ever using pie crust ever. What am I doing wrong? Hi Jenna, I’m sorry I just now saw your comment. I generally only check comments once a day. You likely have finished your pot pie and it either turned out or it didn’t. Did you make your crust from scratch or did you purchase the pre-made crust? If so, what brand did you purchase. Some crusts can be slightly thicker than others. Also, did you have the problem both with the bottom and top crust or just one or the other? Also, are you sure that you set the oven to the correct temperature or that your oven heats correctly? (for example, my sister’s runs about 25 degrees too warm so she has to adjust her baking times on many things). I’ll see what I can do to help out should you want to give it another try! I doubled this recipe to make lots of mini pot pie pans. My elderly mom loves chicken pot pie and has been buying frozen ones. Too much sodium and preservatives for my liking so I decided to make a bunch for her freezer. I added potatoes and frozen mixed veggies. Wegmans has wonderful pot pie tins with clear plastic lids. I still cover with foil for a better seal but put the date on a piece of paper inside the lid. This protects the crust from breaking in the freezer too. Hi Mindy! Thanks for your feedback and tips too about the pot pie tins! We don’t have a Wegmans near me but many other readers might–although now I’m going to want to go on a hunt for those pie tins. Great way to modify and make it quicker using frozen mixed veggies too. I hope you and your mom continue to enjoy this pot pie! Do you have a pie crust recipe you use for this? I usually use the store-bought ones from refrigerator or freezer section most often–much easier! I have made this several times for my family and even the picky ones love it. They tend to sneak spoonfuls out of the bowl while the mixture is cooling. Thanks for the recipe. Thanks Allie for the feedback! I love to hear stories like this and am so glad that your family enjoys the recipe as much as my family does! Have you tried making this into smaller one person pie dishes? Wondering how the baking time would change from frozen if done that way. Yes, Lindsey, I have made into smaller one person pie dishes! If it’s made from frozen it takes about 30-40 minutes, if from fresh, then about 20-25 minutes. Oven temps stay the same. Let me know how it works out if you give it a try! I’ve been using this pot pie recipe for a couple years and it’s a solid go-to recipe!! So simple and flavorful. I add fresh rosemary and thyme. Also try to use homemade chicken stock when I have it. It’s always a hit with my family. Thank you. I’m making it today and decided I’ll finally comment about it. Thank you G Lori for your feedback and for letting me know how much your family loves this recipe! I bet the rosemary and thyme add a nice depth of flavor–yum! We have a large family and are preparing for twins so I doubled the recipe. We are going to eat one tonight and I’ll put the others in the freezer for after the babies arrive. Just the filling tastes amazing! I can’t wait to try it baked tonight. Thanks for sharing your recipe. Thanks for your comment Whitney! I hope your whole family enjoys it and wishing you all the best for when the babies arrive! My grandkids beg for this all the time. Never frozen it before. Will try It . I’m so glad you like it Margaret! Absolutely loved this pot pie! Perfect recipe! I cut it in half but will double it next time to make freezer meals before my baby comes. Creamy and flavorful, so comforting and perfect for fall! Cant wait to make again! Crissy, I’m so glad you loved it! Thank you for taking the time to let me know. It will be perfect comfort food for when you baby comes. Enjoy! I LOVE pot pies. But, its only me. 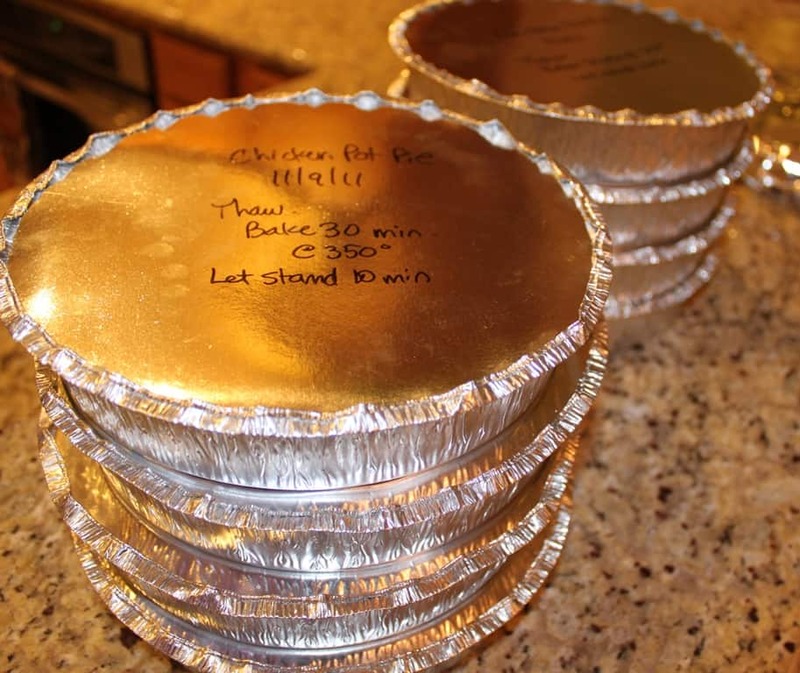 can I make these in those small individual pie tins (got a whole bunch off amazon a while ago) and still keep the same times and temps? Hi April! You sure can make these in the individual pie tins! I would recommend baking them at the same temperature for about 20 minutes, checking after 15. If you are baking from frozen, double that. Let me know how it turns out! My fiance and I love these pot pies. Since it’s just the two of us, I get the smaller round pans and actually stretch this out into three pies, then we’ll each eat half. It is so nice to have them on hand when I don’t feel like cooking after work, I can pop it in the oven straight from the freezer and it turns out great every time. Some suggestions: I add 1/4 teaspoon of each thyme, basil, and sage when adding salt and pepper. I also do an egg wash over the top crust which makes it a beautiful golden brown when done. Thank for the wonderful recipe Brenda. Megan, thanks so much for your kind feedback and for the suggestions on how you’ve modified the recipe to suit your tastes. I will have to give them a try! Hello. I’m making these for the first time and they are delicious! My question is I was wondering why you have to let the filling cool before putting it in the crust. Thank you for the yummy recipe! Hi Jennifer! The main reason you let the filling to cool is that allows it to thicken up before baking. Seems counter-intuitive but if you don’t the filling will be much runnier after baking. Enjoy! Instead of fresh carrots and celery, can you use a bag of frozen mixed veggies? I think it’s usually carrots, peas and corn. Karie, you sure can use frozen veggies! We don’t like corn in our pot pies but I do know you can purchase just diced carrots so if you prefer, you can also just a bag of each-the carrots and the peas. Enjoy! I made this tonight and for some reason the bottom crust didn’t really cook, while the top did. Any idea what I could be doing wrong? Karie, I’m sorry I’m just now seeing this! A couple of questions…what kind of pie plate are you using? I find that a glass or ceramic one works best although an aluminum one works ok too. Another factor could be if you are using a deep dish pie plate or not. Can you let me know a little more info and I can help troubleshoot it for you! I know some people also just do a top crust and do it more like a “cobbler”. Would you be able to use rotisserie chicken for this and then freeze it? Lindsay, yes! I have used rotisserie chicken as the chicken and it is yummy. 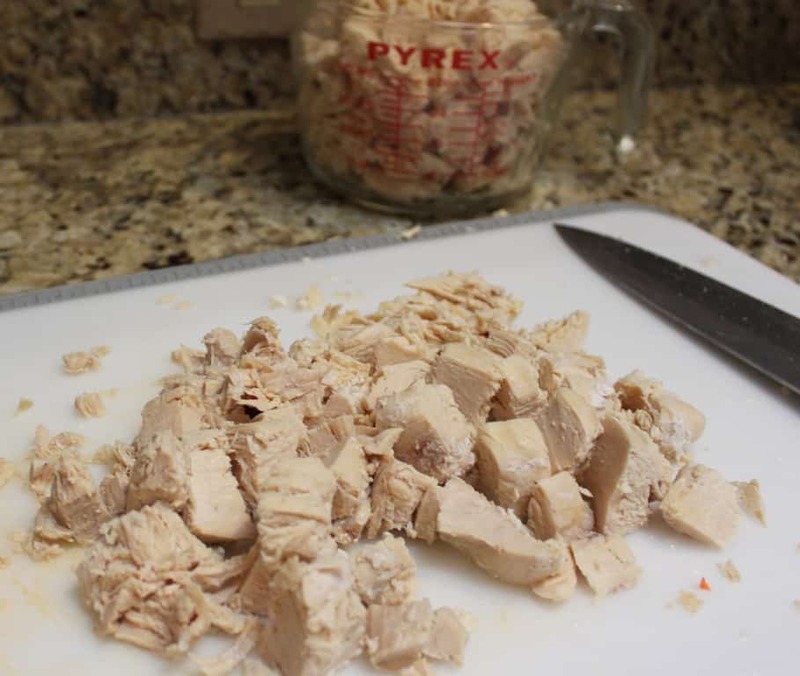 Just substitute for the plain cooked chicken and prepare the recipe as written for everything else. Enjoy! I usually purchase the regular size refrigerated crusts because I use a regular size pie plate. If I were using a deep dish pie plate, I would buy the larger size crust. If you are using deep dish, realize that you will use more of the pot pie filling so the recipe may not make the two regular size pies as indicated. Hope this helps!